On a lightly floured surface, roll out the dough into a 33 cm (13-inch) square. With a brush, cover the entire surface of the dough with the butter. Roll up tightly and cover in plastic wrap. Refrigerate for 30 minutes. Cut the ends of the roll. Cut into 14 slices. On a floured surface, thinly roll out each slice with a rolling pin. If the dough is too large, cut off the excess with scissors. Refrigerate while preparing the filling. In a saucepan off the heat, combine the sugar and cornstarch. Add the egg yolks and egg and whisk until smooth. Add the milk, corn syrup, vanilla and cinnamon stick. Mix thoroughly. Bring to a boil over medium heat, whisking and scraping the bottom and sides of the pan. Simmer until the mixture has thickened. Remove from the heat. Strain through a sieve. With a 45 ml (3 tbsp) ice cream scoop, spoon the filling into the tart pans. Smooth out the top of the filling with the back of a spoon. Bake immediately for 13 to 15 minutes or until the top is caramelized and the crust is crispy. Let cool before unmoulding. Season with cinnamon before serving. In our second entry, we pay tribute to the world's greatest cake, the Molotof cake. 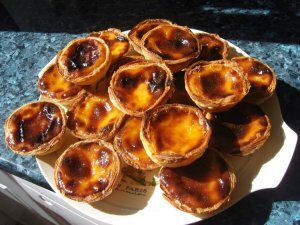 We usually eat these cookies in Easter, but in Portugal you can find them in any festival/fair. This recipe has been in my family for quite a while, some people do it differently but this is how we do it. They should be kept in an air tight container so they can maintain their flufflyness. Preheat the oven to 170 ºC (325 ºF). In a saucepan, heat the cream for 5 minutes with the vanilla bean cut in half, without boiling, just to infuse the vanilla. Scrape out the vanilla seeds and combine with the milk. If you are not using a vanilla bean, simply add the vanilla extract to the hot cream. In a bowl, whisk together the egg yolks and sugar. Stir in the hot cream. Pour the mixture into four 180 ml (3/4 cup) crème brûlée dishes or ramekins. Bake in a water bath. To do this, place the custard dishes in a baking dish. Pour hot water 3/4 up the sides of the dishes. Bake for 40 minutes. Let cool and refrigerate to chill completely. Sprinkle with the additional sugar and caramelize quickly with a crème brûlée iron or a torch. 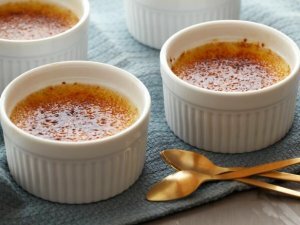 You could also caramelize the crème brûlée under the broiler of a very hot oven. Serve immediately. In a saucepan mix the milk, egg yolks and butter. Bring to a low heat for about 10 minutes until a smooth and creamy consistency. Remove from heat and stir in the vanilla essence and lemon juice. Stir it in well until it is smooth and consistent. Set it aside in a bowl. In a bowl, dissolve the yeast and sugar in milk. Combine all ingredients except flour and mix well adding the flour gradually until the dough is easily shaped and kneaded. Form medium sized balls and let them rest on a board sprinkled with flour. Cover with a cloth and let it rise for about 1-2 hours. Fry the balls in a deep frying skillet or pot on high eat one by one until they are golden browned. Turn them over as they fry. Once they are done, place them on a platter with paper towels to dry. After they have cooled slightly, cut them in half without dividing them completely. 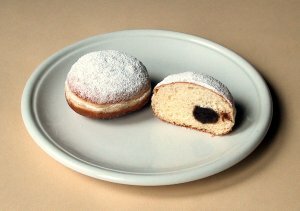 Fill them with the previously prepared cream and sprinkle with the powdered sugar. Serve.